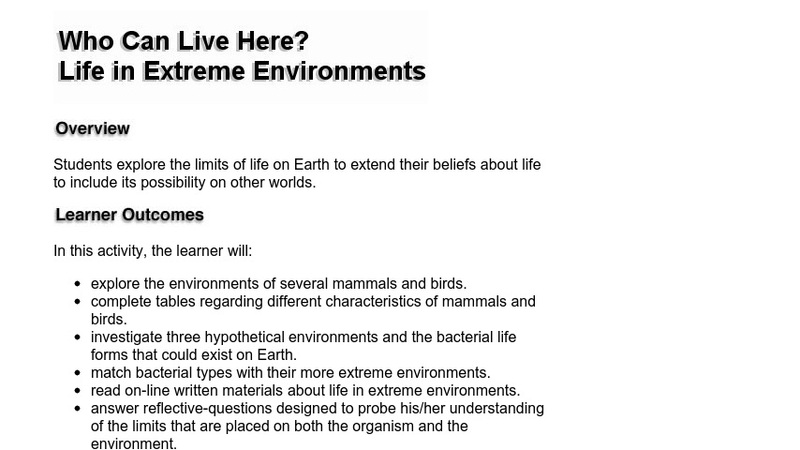 Astrobiology in the Classroom leads students in the exploration of the limits of life on Earth to extend their beliefs about life to include its possibility on other worlds. In this four-part activity, students first explore the environments of several mammals and birds to better understand how living things and their environments interact and depend on each other. In the second part, students match bacterial types with their more extreme environments. Students discover that an environment's temperature, salinity, pH, and sources of carbon and energy are important for what can live there. Next, students are given readings on life in extreme environments that cover the latest scientific findings in this field and are asked to answer reflective-questions. With their new understanding of the limits of life on Earth, the final part guides students in the exploration of environments on other planets and moons in our Solar System. Word is required for opening this document.